Last September, we treated the fine people of Stratford to a fiery feast to remember with our first ever Brazilian Rodizio night, giving people from all walks of life the chance to experience an extra slice of South American flare. The response was amazing as you came and conquered in your masses, clearing more plates than we ever dreamed possible! In fact, it turned out that you loved our fiery, Brazilian buffet so much that we simply HAD to host another one the following month – but it still wasn’t enough! 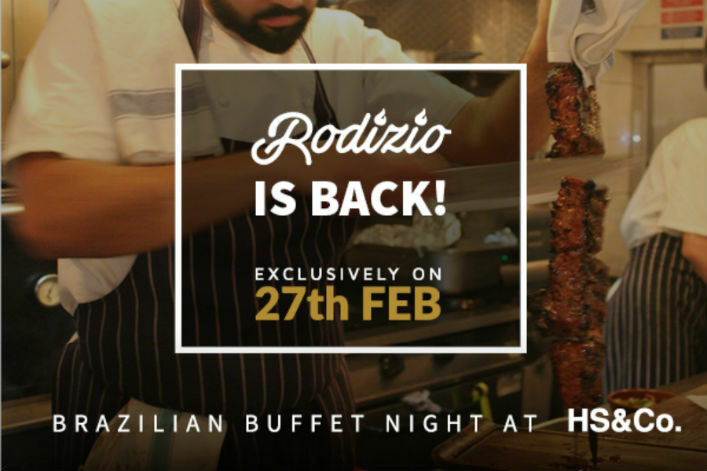 So brace yourselves for the news you’ve all been waiting for; the Rodizio will return once more on Tuesday, 27th February! As ever we’ll be loading our fiery Josper Grill with a range of traditional Brazilian favourites, giving you the chance to escape those bitterly cold, wintry winds and lose yourself in the flavours and aromas of Brazil’s vibrant culture. The best bit? You can enjoy as much food as you can stomach for just £23 per person! The special, mouth-watering menu for the evening will be headed up by the famous Picanha (Sirloin) – widely considered to be the ‘finest’ cut of meat throughout Brazil. Also available will be the Alcatra (Rump), Costela de Carneiro (tender lamb ribs), Figado de Galinha (rich chicken liver), Frango com Alho (chicken thighs with garlic), spicy beef sausages by Italian connoisseurs, 20 Ways and Brazilian-style Chicken Wings, as well an abundance of sides. Check out the below video from food gurus, Halal Hangouts and see what they got up to at our last event! “Our passion at HS&Co is providing great quality, Halal alternatives. We’ve loved the positive feedback we’ve received at our previous Rodizio nights and several customers admitted to me that they would never have tried Brazilian-style cooking without our events, so we simply had to host another. It’s a really rewarding experience for us as a restaurant and we’re really excited for February 27th,” explains Great British Halal Chef, Hamza. The sizzling spectacular will take place from 6pm – 10pm. Demand has exceeded supply at our previous two events, with places snapped up before we could barely say ‘churrascaria!’ Due to the anticipated high-demand, reservations will only be accepted in advance, so you’ll need to book early to avoid disappointment. You can secure your table by heading to our website, www.hsandco.co.uk, or by calling 0208 555 3322. Alternatively, you can visit our Stratford restaurant, located at 405 High Street, Stratford, E15 4QZ – we’d love to say olá!